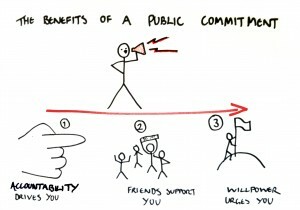 One of the most powerful StopTalkingStartDoing things you can do is to make your commitment public. Of course, we’re tempted to keep our real ambitions secret so we can handle our fear of failure in private. But this is a mistake. Making it public gives you strength. On the stoptalkingstartdoing facebook wall people are making their commitment to Start Doing something. The moment in time when we make a public commitment is the one when we’re feeling strong and determined and, maybe, exasperated with the same old pattern. Harder days will be ahead – whether you’re giving up smoking or trying to raise cash for your business. And the temptation to give up is ever present. But because we make the promise when we’re strong we hold ourselves to the standards of our strong positive self; our better self. It’s a kick in the pants to our weaker self. 2. It makes you accountable. There are two sides to this coin: If you reap the glory of announcing your mission then you also have to tell the world if you back out and don’t give it your best shot. A line was drawn on a piece of paper. Researchers asked people to guess its length. Some declared their estimates publicly, others not. When told their estimates were wrong those who kept their answers secret were tended to pretend they had never made the wrong estimate in the first place. 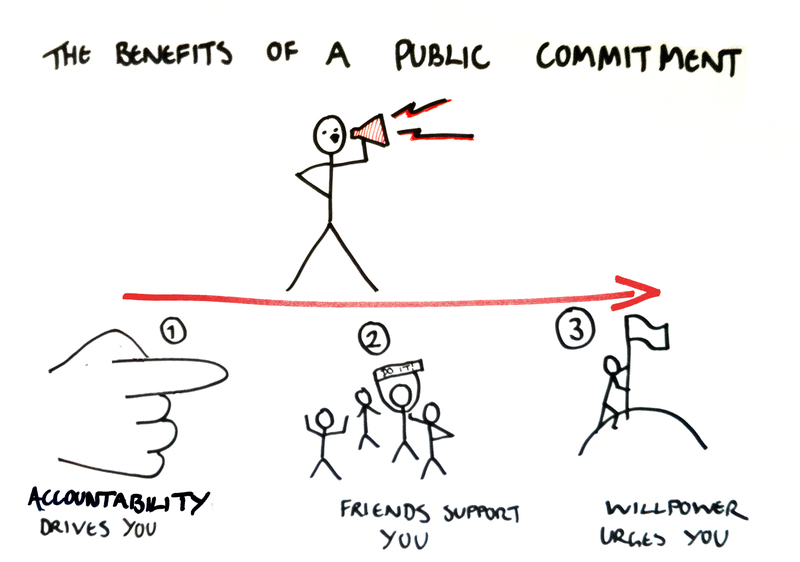 In other words – even in this trivial example – a public commitment helps you stay true to yourself and your promise. Stating your commitment creates the pressure behind you not to turn back. If your friends and family know about your commitment to StopTalkingStartDoing they’ll urge you on. When you’re flagging or doubting they’ll be there to help. One study showed that people facing a mountain judged it to be 15% less steep if they were standing with friends than when they were on their own. Things seem easier when your friends are with you. Knowing what your goal is helps your team support you. 4. And it starts now. Which is why making it public is a good way to begin.